What is the ideal space for an aluminum piece? Digital files can be printed directly onto an aluminum substrate, thereby allowing a metallic finish to come through the image. Aluminum substrate captures and reflects light to enhance the depth and color of the image. Aluminum provides a very clean, contemporary look that presents well in modern and high-technology spaces. Any image that GAA has the rights to re-sell and is high enough resolution for the desired size. We have millions of available images, and we can set up an online project for the client with selections. We can also use client provided images, so long as they have the right to reproduce the image and it is high enough resolution for the desired size. How are aluminum pieces mounted to the wall? Aluminum art can be mounted to the wall three ways: (1) with one-inch brushed stainless steel standoffs (“pucks”), (2) with one-inch brushed stainless steel locking standoffs, or (3) cleated with ½” rigid PVC. What is the most commonly used method to mount aluminum pieces? 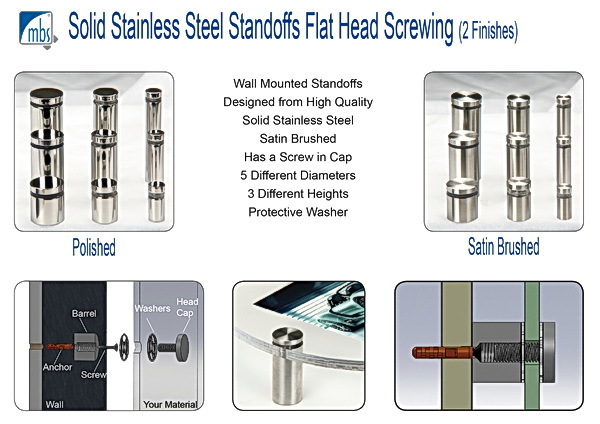 Mounting aluminum pieces with one-inch brushed stainless steel standoffs ("pucks") is the most common way to affix aluminum to a wall. To accomplish this, four (sometimes six depending upon the size of the image) small circular holes are drilled into the corners of the aluminum. The metal standoffs are then placed in the holes and screwed into the wall. Once mounted, the aluminum piece will sit one inch away from the wall. What are the standard specifications of your aluminum pieces? All pieces are produced with 1/8” brushed aluminum composite, the thickest aluminum substrate on the market. The aluminum pieces will not bend or warp during shipping or installation. Holes drilled in 4 corners of each piece (center on border or 1 to 1) (10 mm hole size for 1” standoffs). Oversize pieces may require 6 or more holes/standoffs. What is the turnaround time for aluminum art production? Typically, the turnaround time for aluminum art pieces is 2-3 weeks. Who coordinates aluminum art installations? You may choose to find an installer yourself, but we are experts at coordinating low cost, quality aluminum installations for clients. We will hire a local, qualified art installer to install your aluminum pieces. Our art installer will install the pieces in accordance with our installation instructions and specifications. All installation costs (should you want us to install the art) will be included in the quote provided to the client. How do I clean aluminum pieces once they have been installed? You can use a soft cloth or feather duster to clean your aluminum art. It is not recommended that you use chemicals, cleaners or abrasive cloths on this substrate because their use could cause damage to the aluminum or the image.